Upon delivery or change of flag of a ship, and on ships in service, periodical surveys by the flag state administration or by a recognized organization (classification society) are required. These surveys form the base for the issuance of ship safety certificates and their renewal or extension of validity. By means of the surveys flag states ensures compliance of ships under their flag with the requirements regarding ship safety or working and living conditions on board. The International Maritime Organisation (IMO) has adopted mandatory regulations for the safety of seagoing ships with several international conventions. 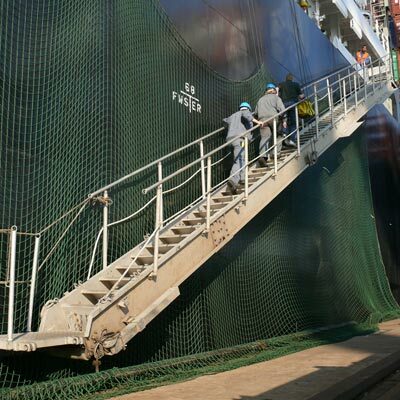 In particular the International Convention for the Safety of Life at Sea (SOLAS) provides in chapter I of its annex detailed requirements for survey and certification of ships. The IMO has compiled scope and scheme of all ship safety surveys in the „Guidelines under the Harmonized System of survey and certification“. This is where you can find the latest version of these guidelines. The ship safety division is in charge of all surveys regarding ship safety and maritime labour law, except surveys of navigational and radio equipment for which the BSH is responsible. No special application is required for the surveys regarding ship safety and maritime labour law (except for navigational and radio equipment). The ship safety division arranges automatically for surveys when it receives an application for changing to the German flag or an announcement of newbuilding. Many surveys, especially abroad, are performed by surveyors of recognized organisations. For any newly constructed, modified or refitted ship a plan approval of the ship’s navigational and radio equipment is required. This plan approval is part of the initial survey. By means of drawings and documents it will be verified, that all requirements regarding arrangement, fitting and installation of the ship’s equipment are complied with. This helps to prepare the ship’s survey and to avoid costly modifications, which might otherwise become necessary. The procedure is specified with the „Bedingungen für die Planprüfung der vorgesehenen Aufstellung, Anbringung bzw. des Einbaus von Navigations- und Funkausrüstung sowie Ausrüstung nach COLREG 72“ (BfP) (Conditions for plan approval) of the BSH. This document includes in its annex special requirements regarding the arrangement of certain items of equipment. The BSH forwards a copy of each approval certificate to the ship safety division, in case of newbuildings also a list of the navigation equipment. Please submit the required documents in time. This minimises the risk of costly modifications to faultily arranged items of equipment. The plan approval is followed by the initial survey, which will verify that the installation of the ship’s equipment complies with the approved plans and that the items of equipment are as approved and functioning correctly. The testing of equipment is usually performed on board. Replicate tests, which must be performed periodically, focus not only on the correct functioning of the equipment, but also on modifications which could have been made since the previous survey. The frequency of the surveys for equipment depends on the period of validity of the certificate and on the ship type: Passenger ships annually, fishing vessels of more than 24 m length biannually, other ships quinquennially and after substantial maintenance work. Radio equipment is to be surveyed annually on all ships. The surveys are carried out by the BSH in accordance with the „Bedingungen für die Prüfung der Aufstellung/Anbringung von Navigations- und Funkausrüstung sowie Ausrüstung nach COLREG 72“ (BfA) (Conditions for arrangement). Standard-magnetic compasses and steering-magnetic compasses which are permanently fitted on board of ships under the German flag must be adjusted before being used and later periodically at two year intervals. This has to be done by a person recognized either by the BSH, based on proven competence, or by an IMO member state. Special recognition by the BSH of compass adjustments performed abroad is no longer required. Please click here for the list of recognized experts for compass adjustment. The BSH may authorize other bodies to perform parts of ship surveys and individual laboratory tests. Such bodies must possess the status of a recognized body and are scrutinized accordingly. Recognized bodies of the BSH must fulfil the „Bedingungen für die Anerkennung als Einrichtung zur Durchführung von Besichtigungen und Laboreinzelprüfungen im Auftrag des BSH“ (BfE) (Conditions for recognition). Please click here for a list of recognized bodies for testing of navigational and radio equipment.